Here comes yet another end of the day unwind…..I hope it brightens your Friday dance routines today! But let’s face it….um, the weekend’s almost here, do we need further brightening?! I enjoyed putting this painting together with the help of Tombow markers, Portfolio pastels, Inktense pencils, Lumiere metallic acrylics….and a dusting of dollar-store golden eyeshadow for a bit of extra glimmer. It was a glorious 70 degrees yesterday, and so wonderful to have a few minutes away from the desk to enjoy it. Spring has finally arrived here, and I hope it’s alive and blooming where you are, too. See you Saturday! It has brightened my dreary rainy Friday morning here. But the gloom may be lifting and I hope the sun will shine later. Thank you, I’m so glad to have brightened your morning. We are so grateful for sunshine after the winter we had. I hope it peeks out for you today! Jean, you were born to make people feel great about themselves! Thank you. I hope you and your family have a wonderful Easter. When you have about 12 of these, you ought to photograph them together. I bet you could have fun arranging them too. Ooh, that’s a good idea. Quilt background was my next thought. so uplifiting for our dreary morning here! I love the glitter of the eye shadow! Such a creative use! You are always an inspiration and bright spot in the a.m.! happy friday dancing with you, Laura! I sent you an email BTW. PS I’m embarrassed to share at least 1/3 of the stuff I post here lol! But people seem to appreciate or get a kick out of it, so it’s all good! Thank you!!! :))) You are a born Joy Booster, lady! PS and Happy Easter to you and yours, Jodi! Enjoy seeing what you come up with and brilliant ideas of using different medium. Eye shadow… smart. Thanks! But I can’t take credit for that. I learned a lot from The Frugal Crafter. She’s here on WordPress. She should write a book! I just zoomed in close to see all the glittery metallics – neat. 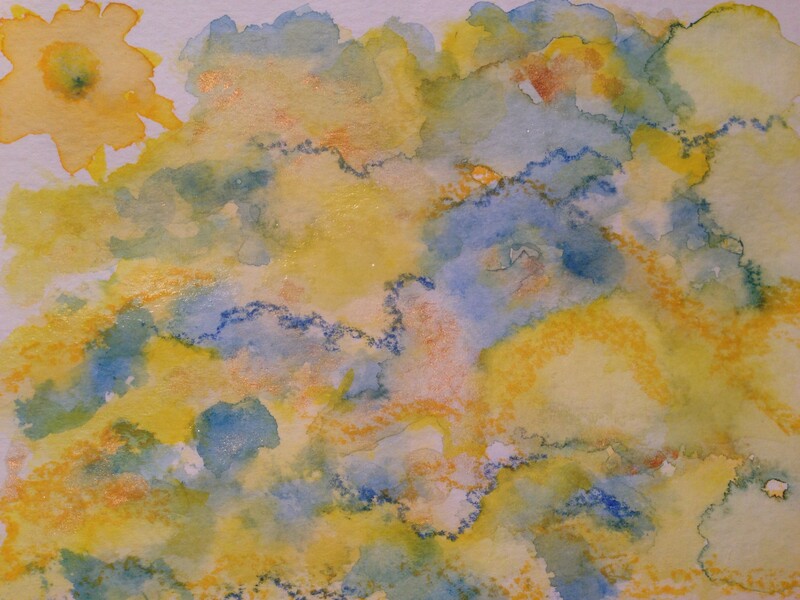 Blue and yellow, reminds me of Provencal French pottery. Have a great weekend! Thanks! Love blue, yellow, purple. I hope you have a great weekend and Easter, too! I do love your colorful work….hugs!! These are lovely springlike colours!